UCV says: A book like this would never have found its way to my book shelf had my father-in-law not been clearing up his, and relieving it of some unworthy weight. Not that this book is unworthy, but it is definitely not a keepsake. 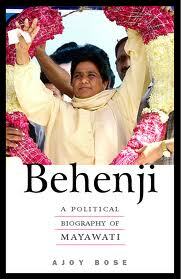 It is no more than what it claims to be – a forthright political biography of Mayawati. Why I chose to read it? Because, doesn’t this juggernaut of a woman make one curious? cant believe a book with such a name too exists!! I think I am your gutsy best, FL. And yes, bring the weird ones on! I think I'd probably have decided to wait for the movie, if I hadn't read this post.